The seeds which eventually germinated into the formation, growth and development of Eastern Harps, however unwittingly to those present, may have been sown at a Sligo GAA County Board meeting in the spring of 1964. Breaking with traditition, up to that point, the Board decided that the senior club championship for that year would allow the amalgamation of two neighbouring junior clubs to enter the premier senior competition. An intermediate football grade was not in place in Sligo at that particular time. With the names of the powerhouses of Sligo club football like Tubbercurry, Craobh Rua and Curry flying into the hat for the eagerly awaited draw, the Keash county board representative and current Co.Board registrar Michael F Regan left delegates somewhat bewildered by declaring “ Put my name in that hat”. When quizzed on the name and make up of his team the sharp minded Michael F Regan thought for a moment and then replied “ Just call them”St. Kevins” Into the hat St. Kevins went and the draw was made. Although both Keash and Gurteen clubs were not doing particularly well at the time and both of them in junior ranks Regan had spotted a half dozen or more of talented and mainly young players available in both parishes. But it was not a researched manoeuvre and he still had to sell the idea to two junior clubs whose rivalry was intense and deep rooted. If football was not particularly strong in both parishes at the time then interest certainly was as evidenced by regular sums of twelve and fifteen pounds being collected at the gate, which does not sound astronomical nevertheless with six old pence being the entry fee it still represented a crowd of approaching six hundred paying customers with several others managing to find an alternative route to watch the action. Michael F. Regan in whose memory we have named our clubhouse at Fr. Kevin Brehony Park in Keash was a charismatic and persuasive gentleman and even if less well liked in Gurteen than he was in Keash he knew how to talk to the powers that be in both parishes and convincingly sold the idea. With the likes of Brian Tansey , Tony McDonagh, Tommy Joe Convey and Owen Tansey leading the Gurteen contingent and Johnny Benson, Sean Carty, Jimmy Greer, Sean Fox and a youthful Kevin Cryan to the fore from Keash, the rank outsiders St. Kevins went all the way to the county senior final, along the way beating the favourites Pride of the West (Ballisodare St. Patricks) led by the legendary Mickey Kearins. Beaten in the final by Curry this local crusade into senior ranks left its mark and was talked about for many years afterwards. But there was to be no immediate marriage and resuming hostilities of the past, both parishes went their separate ways for six more years, remaining in junior competition with little or no success. In 1970 another development emerged as with Gurteen failing to find a team to compete a half dozen or so of their footballers, Joe McDonagh and Padraig Molloy included were allowed to play with Keash in junior competition. This more recent merger proved a great success as Keash, legally assisted by the Gurteen contingent and with Sean Coleman the driving force, went on to win the junior championship.A further two years of individual competitive struggle followed for both sides with Gurteen really struggling to field teams. However events of 1964 and 1970 were beginning to have an affect. With Ireland joining the E.E.C. ( now the E.U. ) about this time and decimal currency taking over from the old pounds, shillings and pence mergers and changes were the order of the day. In club football in Sligo two neighbouring parishes Knockalassa and Sooey had merged in 1972 to form Shamrock Gaels. Quite ironically Michael F Regan who brought about the joining of the two junior clubs in 1964 to form a once off but formidable senior side did not favour such an amalgamation. A lasting merger between intense local rivals Keash and Gurteen looked remote. Gurteen and Keash, just a few miles from each other, seemed a long way apart in those days and those involved in the G.A.A. generally kept their distance. When pitted against each other an atmosphere of hostility prevailed. There were old scores from distant days prevelant , fresh ones simmering and a given number of influential individuals from both parishes steadfastly against any such amalgamation. But there was support too for such a brave initiative with little green shoots from experiences of 1964 and 1970 appearing. Local school teacher John Higgins emerged as a powerful power broker for amalgamation on the Keash side ably assisted by a few others most notably Sean Coleman and the young recently qualified school teacher Padraig Duffy. At the Gurteen end Nicholas Ryan and P.J.McKeon were among those involved. Meetings were held with the pro’s and con’s fully discussed. An amalgamation was never going to be unanimous, or have wall to wall support notwithstanding this a majority for, was recognised locally so in the spring of 1973 officials from both sides met and Eastern Harps was officially formed with John Higgins its first chairman, Padraig Duffy its first secretary and Nicholas Ryan its first treasurer. To remove any probable conflict the group were careful not to have the name of Keash or Gurteen involved in the new set up hence the name of Eastern Harps. The club colours was another point of compromise as the vivid red of Gurteen and the royal blue of Keash were sacred to the point of worship in both areas. Therefore a white jersey with green collars and cuffs coupled with white shorts was chosen to neutralise any possible suggestion of favouritism. With no football field of our own to play in or train in the officials of Eastern Harps led by the determined John Higgins set about the mammoth task of building a club. Negotiations with Boyle G.A.A. and The Corran Park Committee resulted in a certain level of training being allowed in both grounds. The appointment of Senior All Ireland medal holder from 1944 John Joe Nerney of Boyle as trainer together with the appointment of John Higgins as team manager greatly facilitated this while the use of Conlons field in Gurteen on a year to year basis ( one of the old venues of Gurteen G.A.A, ) gave us a pitch for home matches. The new club was gelling well in 1974 however nobody not even the most optimistic amongst us could have predicted what happened in the following year 1975. With the now veteran Brian Tansey guiding a host of fine young players like Denis Johnson and Rory Tansey, the Garvin brothers influential and new captain Michael Hannon at his creative best from centre half back we marched all the way to the senior championship final despite being given little chance in every round. Our opponents in the final were the leading Sligo town team Craobh Rua with the final taking place at Corran Park in Ballymote on Sunday October 5th. 1975. Sensationally we were given little chance in this match also but playing fine inventive football we emerged victorious getting our hands on the Owen B Hunt Cup for the very first time. It was a time of unprecedented celebration, a historic and mould breaking victory for the founder members and a massive boost for the fledgling club. Defeat in the first round of the Connacht club followed to strong opponents Roscommon Gaels. Continuing to compete well for the following five or six years we reached two county finals in 1980 and 1981 only to receive a heavy beating in both by Sligo town side St. Mary’s who in the early eighties had an exceptional side and were dominating Sligo club and indeed Connacht football. Although we reached the county senior final in 1981 we were relegated to intermediate for 1982 the rule of the day being based on league performances and not on championship performances. Continuing to bond as a club, even if there were the odd pieces of criticism here and there at having been demoted, we won the intermediate championship in 1983 beating Bunninadden in the final thereby gaining senior status and thankfully have stayed there ever since. The remainder of eighties saw us hold our own competitively at senior level without any silverware, however the club emphasis now became firmly focussed in two areas, under age football and playing facilities. Christy Gallagher had taken over as club chairman in 1980 and had identified both areas as being of paramount importance to future success. Management teams were put in place to look after each individual under age group, so success followed albeit slowly. A fund raising campaign saw us purchase a playing field in Keash which was officially opened in 1990 with a challenge match between Sligo and Mayo. Dedicated to the memory of a former Keash footballer Fr. Kevin Brehony this was an important step as it provided a platform for a glorious decade in the nineties. A further training field was purchased and developed in 1999. Following another successful fund raising drive which culminated in Jimmy Casey being crowned “Emperor of Eastern Harps” a new floodlighting and perimeter fencing development went ahead in 2004. More recently in 2009 the pitch has been upgraded with a new set of dressing rooms now being planned. Our ladies club came together in 1993. With Christy Gallagher to the fore as chairman our ladies entered competition for the very first time and quite sensationally won the inaugural senior ladies championship that very same year. Christy Gallagher also had the distinction of managing that same ladies team to victory having taken over mid season from appointed manager Peter Walsh whose senior football commitments robbed him of the time needed to direct the ladies. In the years to follow ladies football expanded with teams now being entered in all under age grades and several trophies won details of which are available on “Roll of Honour” another page on this website. The early nineties saw the face of club football in Sligo change. Our rural neighbours Shamrock Gaels had won two senior championships in 1990 and 1992 and we had an intense rivalry with them even if they held the upper hand at that time. Skilled management teams were now firmly in place and accepted as a must have. Sponsorship with the sponsors logo festooned across the jersey was gaining strength. However the biggest change of all came with more detailed training and preparation. Denis Johnson joined us as senior team manager in 1993 and this proved to be a judicious step forward. With Paul Taylor emerging as an eighteen year old player of real quality we won our second senior championship that year, beating Tubbercurry in the final, with county player Marty Grady as captain. We also won the minor championship that year with Paul Taylor as captain together with a splendid crop of fine young talent. Defeat to Leitrim champions Aughawillian followed in the Connacht club championship. 1994 saw Tubbercurry gain revenge by dumping us in the quarter final of the senior championships however we bounced back in 1995 to win our third senior title giving probably our best ever final display. With Eamonn Molloy now captain we had an eleven point win over rivals Tubbercurry but somewhat disappointingly went under again to Leitrim champions St. Mary’s in the Connacht club championship. We reached the county senior final again in 1996 only for three late points from opponents St. Mary’s to thwart us and indeed suffered an eight point defeat to Tourlestrane in the 1997 senior championship final. In 1998 we were back in the senior championship final for the fourth year in a row and determined not to lose out this time as we overcame Tourlestrane in a low scoring tense final. Captain fantastic Paul Taylor lifted the Owen B Hunt Cup aloft but while a famous victory, it was tinged with sadness as we had lost three young men in a drowning tragedy earlier that year including Pauls younger brother Bobby. Once again Connacht club success eluded us when we went under by one point in a fabulous match to eventual All Ireland finalists Ballina. Easkey “Sea Blues” sent us crashing out of the senior championship in 1999 at the semi final stage.while in the millennium year of 2000 Coolera /Strandhill did likewise at the same stage. Further sadness came to our door also about this time as we lost senior players Sean Flannery and Ollie Shannon in individual tragedies. Following nine highly successful years as senior team manager during which we won three senior championships Denis Johnson stood down as senior team manager to be replaced by Eamonn Clarke in 2002 who had also been our club chairman since 1997. Immediate success came to Eamonn as we won our fifth senior championship in 2002 with county player Brendan Phillips as captain and also won our first ever Connacht club championship success that year when taking a notable scalp in Galway champions Corofin in the first round. However Roscommon champions Strokestown defeated us in the Connacht club semi final. 2003 proved to be a remarkable year for us as we were just nominated as Sligo club of the year and reached the four major adult finals within the county namely the senior league and championship finals and also the intermediate league and championship finals. However while we won both league titles that year we were defeated in both championship finals by Curry in the senior and Ballymote in the intermediate. 2004, 2005 and 2006 saw us beaten at the semi final stage in the senior championship and also saw our chairman since 1996 and senior team manager since 2002 Eamonn Clarke step down from both of these onerous posts, the 2002 senior championship victory and the sensational Connacht club victory against Corofin that same year being among his most notable achievements. With Sean Gallagher now in the chairmans seat Denis Johnson rejoined us as senior team manager and despite a few highly influential players being unavailable for the entire year steered us to the 2007 senior championship final where we, a little unluckily, lost out by two points to Tourlestrane. With Denis Johnson again guiding us we came back stronger than ever in 2008 to win our sixth senior championship title defeating Tubbercurry in the final by eight points. 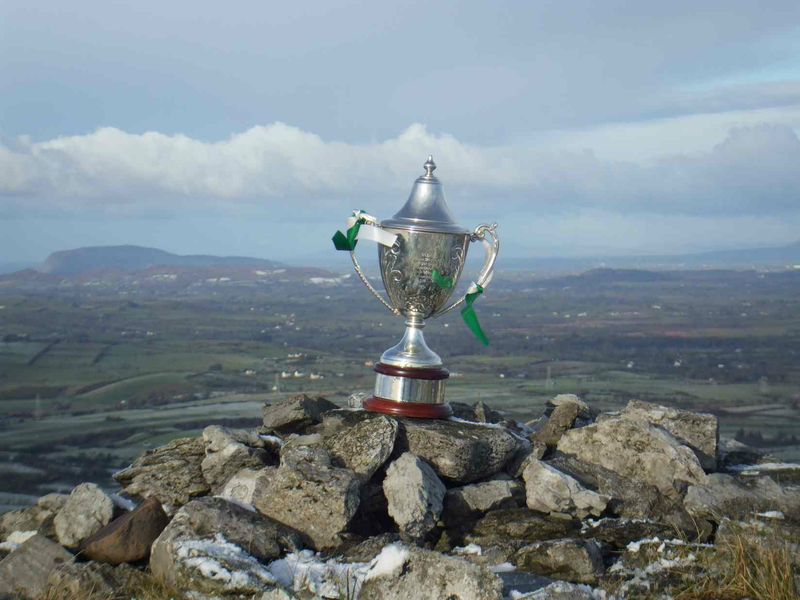 A further remarkable achievement from 2008 is that we won all four senior trophies on offer inside the county, the Pick n Choose Cup, The Senior league Trophy, The Super League Trophy and The Senior Championship thereby completing a grand slam. A super run in the Connacht Club Championship followed with victories over Leitrim champions Glencar/Manorhamilton and Mayo champions Ballaghaderreen bringing us all the way to the Connacht final where we lost out to the eventual All Ireland Finalists Galway champions Corofin. Quite apart from the success of our senior mens side the intermediates and all under age groups have had outstanding victories winning a host of county titles which are chronicled in the “Roll of Honour” section on this website. As the status of our club continues to rise we feel we are now making a notable contribution to Sligo football with a steady stream of county players emerging from our ranks. In 2009 Denis Johnson stood down as senior team manager and former inspirational club and county player John Bruen appointed as his successor. John led the senior team to the county final where they were defeated by Tourlestrane. Some underage success was also achieved this year with the Minor team winning the A shield final and the U-14 and U-12 teams winning B championships. The ladies U-12’s also won their championship. 2010 saw Padraic Henry become the fifth chairman of the club.The senior mens team, captained by Shane King, reached their 4th county final in a row and defeated old foes Tourlestrane to regain the Owen B Hunt Cup. The ladies senior team won the junior league and the ladies U-16 team won their championship. Two of the clubs players, Kevin Gallagher and Barry Cryan, were members of the Sligo junior panel that won the All-Ireland final. Off the field the club was honoured with visits to the club grounds by two distinguised guests-GAA President Christy Cooney and 3 time All-Ireland winning manager with Tyrone Mickey Harte. Having managed the senior team for two years John Bruen stepped aside as manager in 2011 and was replaced with the the clubs first outside manager, James Mitchell from Ballaghadereen. This team lost by one point to eventual winners Tourlestrane in a semi final replay in the championship.